This 625-berth port is open 24 hours a day, 365 days a year. Whatever the weather conditions, the time of day or the tide, the port is a reliable and very welcome port-of-call between the Iroise Sea and the Cotentin Peninsula. The Roscoff deep-water marina, facing the shoreline below the Roscoff Botanical Gardens, has been designed to the very highest environmental standards, is accessible to disabled persons and, protected from the swell by an angled pier, is easy to navigate. This is an excellent starting point for an exploratory trip around the Bay of Morlaix. Roscoff Marina is easily accessible at any time of day and whatever the tide. Its 625 berths offer accommodation for boats up to 18m long on the main jetty, and longer boats, up to a 3-metre draught, along the service pontoon. The fishing dock adjacent to the marina is all of 4 metres deep! To avoid the problem of silting, the pier is wide open at each end, thus allowing sea currents to pass through. At its southern tip, the last jetty acts as a breakwater. There is always someone afloat at Roscoff Marina to welcome you and guide you. At the jetty, you will find someone ready and waiting to help you moor. You can count on experienced professionals, who will offer advice or assistance if necessary. The station is only a 5-minute walk from the port. 10 minutes away, the Old Port - which is still used by coastal fishermen today - lies at the heart of the historic centre of Roscoff, a small city with plenty of character, including some imposing granite houses dating back to the 16th and 17th centuries. A daily shuttle service runs in summer - even on Wednedays, which is market day. You'll find plenty to fill your time, or even tempt you into a longer stay! The easy accessibility of the Port of Roscoff makes it an obvious first stop in the Bay of Morlaix. From there, it's easy to organize your exploration of the surrounding area, sail with the tides, enjoy other nautical activities, investigate the islands and other stunningly beautiful tourist sites, or simply chill out in thePort of Morlaix. When the old Port of Roscoff became inadequate for the high level of commercial traffic, an initiative on the part of Léonard Region small-scale farmers wishing to export their vegetable produce saw the creation, in 1972, of the Port of Bloscon. Grouped under the Saint-Pol-de-Léon agricultural cooperative, these particularly enterprising vegetable growers founded their own transport company - Brittany Ferries. At first used exclusively for the import and export of merchandise, the Roscoff company opened its doors to passengers in 1973. Today, 550,000 people travel through the Port of Roscoff each year, on their way to Ireland and Great Britain. In 2001, a dedicated quay for fishing boats was built. A fish market was created for the sale of fresh fish and seafood (tourist visits can be arranged). The almost legendary local dynamism, put to the service of top quality produce and service, made an instant and rather surprising success of the Roscoff fish market. A logical extension of these activities, and envisaged from the outset, was the creation of a deep-water marina, which rose to the top of the agenda in the years following the millennium. After three years of building work, the jetties were finally ready to accommodate boats in June 2012. The final completion of all works is set for 2013. 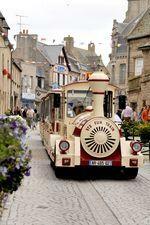 Roscoff will then boast a completely new town district, centred around its marina.